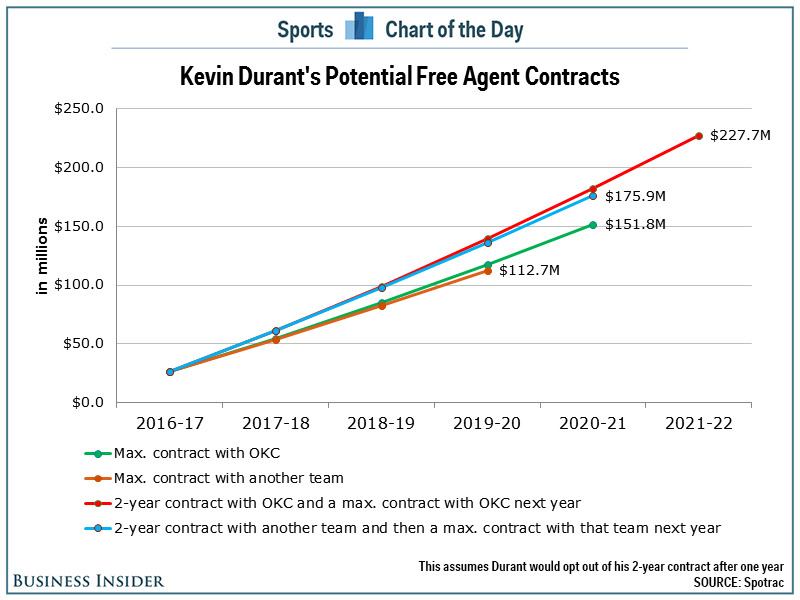 NBA free agency is right around the corner and much of the buzz will surround Kevin Durant and whether he will stay with the Oklahoma City Thunder or perhaps leave for the Lakers, Wizards, or *gasp* the Warriors. While his ultimate destination is a mystery, we can reasonably assume that he will not sign a full maximum-level contract and instead will sign a 2-year deal and it is the smart thing to do. At issue is the surging salary cap. It is taking a big jump this year thanks to a rise in television revenue. But it is also expected to make another large jump next year. The size of max. contracts is directly tied to the size of the salary cap. This is the same path that LeBron James has taken with the Cleveland Cavaliers the last few years. The idea is to sign a 2-year contract and then opt out after the first year. 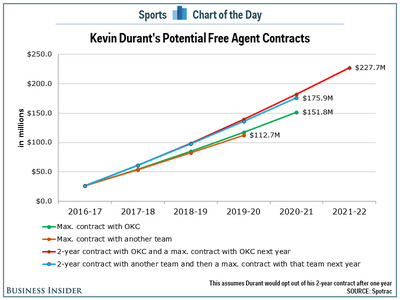 Then, when the salary cap jumps again next year, Durant can sign an even more lucrative deal. Here is how his four main options compare, according to Spotrac. The difference between re-signing with the Thunder and signing with another team is really just the extra year, which can be made up later. Rather, the real difference comes when Durant decides to sign the 2-year deal and go back to free agency next summer.